In a small bowl, whisk together eggs, TABASCO® Original Red Sauce, and salt. Set aside. Place bacon in a single layer on a large non stick pan. Cook over medium heat until the bacon is crispy. Remove bacon from pan and crumble. Drain fat from pan, but reserve 1 tablespoon of the bacon fat. Set aside. Heat the same pan over medium-low heat, once hot, add in bacon fat. Pour in whisked eggs and cook until the eggs are scrambled to your liking. Once cooked, stir in cheese and crumbled bacon (reserve some for garnish, if desired). Taste and re-season, if necessary. Set aside. 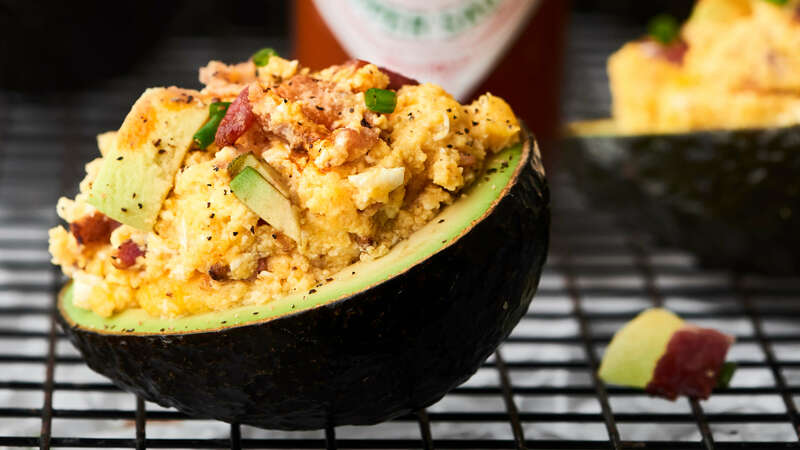 Using a teaspoon, remove some of the avocado, making room for the egg filling. See video for visual. Fill the avocados evenly with the egg mixture. Top with chives and reserved bacon.